Combining the spirit of Polynesian culture with modern entertainment, the popular Maui luau, Drums of the Pacific, brings you an evening filled with the spirit of Aloha. Located right along side the beach in the beautiful town of Kaanapali, this Hawaii luau features a traditional lei greeting, a number of unique Hawaiian cultural demonstrations, and you will even have the opportunity to learn a hula! Sit down and dine on an expertly crafted Polynesian buffet and enjoy drinks from the open tiki bar before the stage ignites with the incredible performances that span across the Pacific. The gentle hula, thumping Tahitian ori, and thrilling fire knife dance, you will be amazed and in awe in this festive and truly Hawaiian experience. What is a Luau? Spanning back hundreds of years, the luau has been an important aspect of Hawaiian culture and history. A luau is a feast. A luau is entertainment. Most importantly, a luau is a celebration. It brings together friends and family with food, music and song, and is one of the most iconic aspects of Hawaiian life. By combining traditional Hawaiian food, modern cuisine, ancient performances, and contemporary music, the luau is used to celebrate birthdays. graduations, weddings, and much more. Local Hawaiian-style teriyaki chicken sits along side the traditionally prepared kalua pork, a whole pig roasted inside an underground oven called an imu, and performances can range from consummate professionals to family members jumping up to the casual strums of a friend's ukulele. Guests who book this package will be seated at one of the center tables, two rows from the stage. This offers a fantastic view of the performance and allows for easy access to and from the buffet. General seating is assigned on a first-come-first-served basis. Book early for a better view of the stage, or consider booking preferred seating for a guaranteed spot up close to the action. The Hawaiian Islands have a long history of warm hospitality, something that is part of the common culture of Polynesia. Come experience that hospitality for yourself. Friendly staff will help you feel right at home in a relaxed and fun environment. The imu ceremony will fill the luau grounds with incredible aromas to build your appetite to a fever pitch. When the buffet opens, you'll be greeted with a variety of carefully prepared options, some familiar and some exotic, but all delicious. Be sure to swing by the open tiki bar for a cocktail. Showcasing dress, dance and music from Hawaii, Tahiti, Samoa, New Zealand and other Polynesian cultures, this dinner show performance will keep you rapt until the 3-man fire knife dance finale! Wheelchair Accessibility: All facilities at the Hyatt Regency Maui Resort & Spa and Drums of the Pacific Luau grounds are ADA compliant. Yes, this luau features activities that will appeal to all ages. In the event of rain, the luau will be moved indoors. If the rain is severe and/or persistent, the luau may be cancelled. This luau is located on the west side of the island, where rainfall is scarce. Cancellations due to weather are rare, but in the unlikely event that this occurs, guests will be given a chance to reschedule or receive a full refund. Yes, the buffet includes a variety of vegetarian options. Kosher, gluten-free and other dietary restrictions can be accommodated with advanced notice. Please indicate during booking to secure arrangements. Located at the luxurious Hyatt Regency Resort & Spa on Kaanapali Beach, nestled on the western coast of Maui, the Drums of the Pacific Luau features panoramic sunset views from an oceanfront terrace, producing a charming, one-of-a-kind atmosphere. What is the buffet menu? 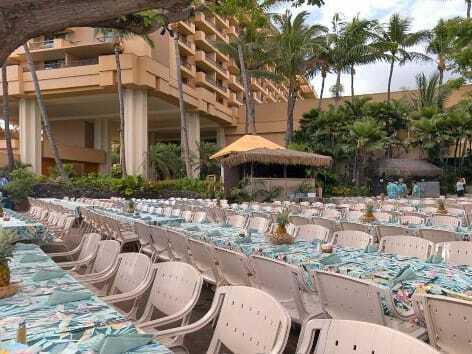 Yes, parking is available for free if you are driving yourself to the Drums of the Pacific luau at Hyatt Regency Maui. Well worth the money. Delicious food, a huge variety of drinks and very entertaining show.